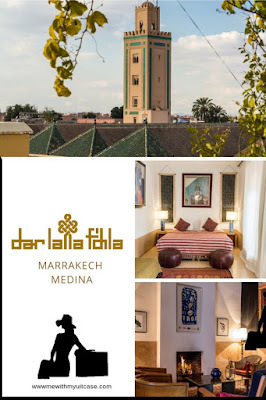 If you are in Marrakech then sleeping in a Riad seems quite a must. 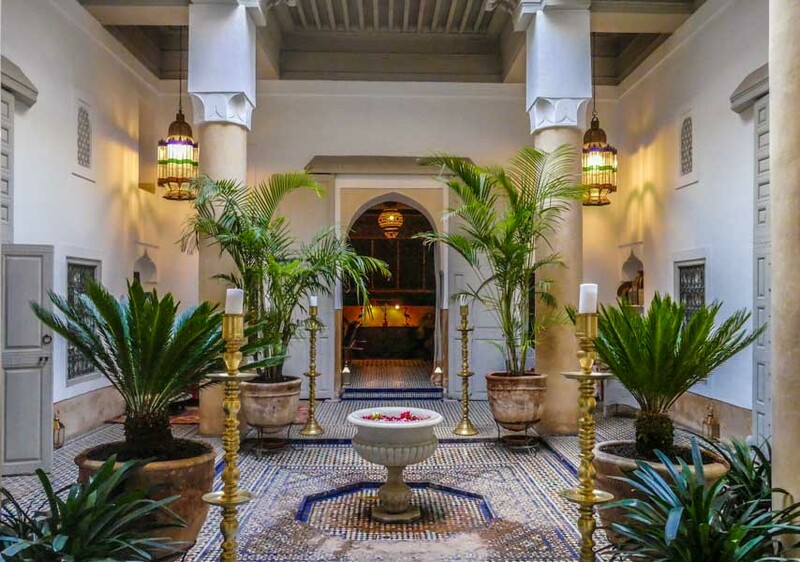 Then, where to stay in Marrakech? 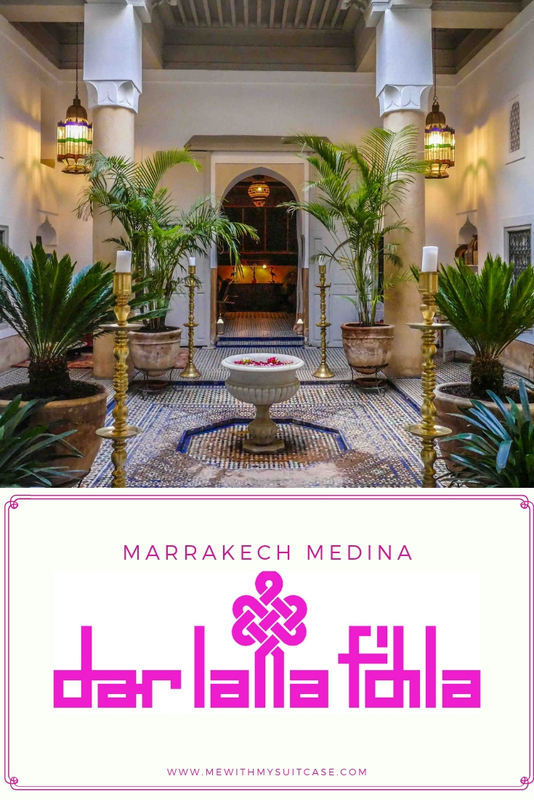 The pink city is home for breath-taking riads and choosing the one which fits to your needs could be really challenging and moreover it may take hours of online research. 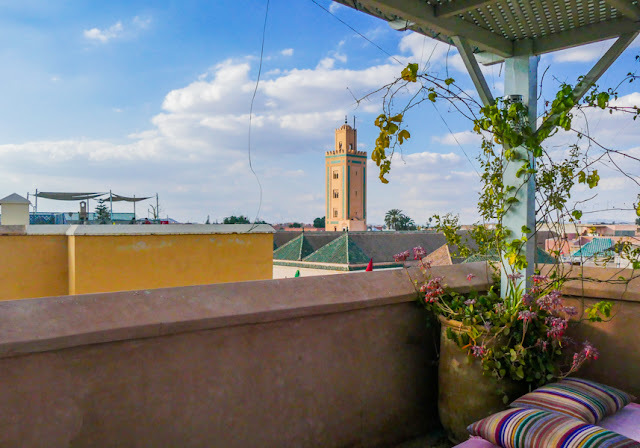 Fortunately our searching led us to encounter something wonderful: Riad Dar Lalla F’dila. Oh yes, the name didn’t help at all, but there was a warm response to our mails from the beginning that we decided to make a reservation. We were picked up at the airport by a taxi arranged by the Riad and arrived in Marrakech in 20 minutes. One of the facts you should know when booking in Marrakech Medina is you won’t be able to go close to the front door by a vehicle and if you are a first-time traveller to there you better ask for help from the Riad: It is something that you will understand only once there! Abdou, the manager, came to help us. 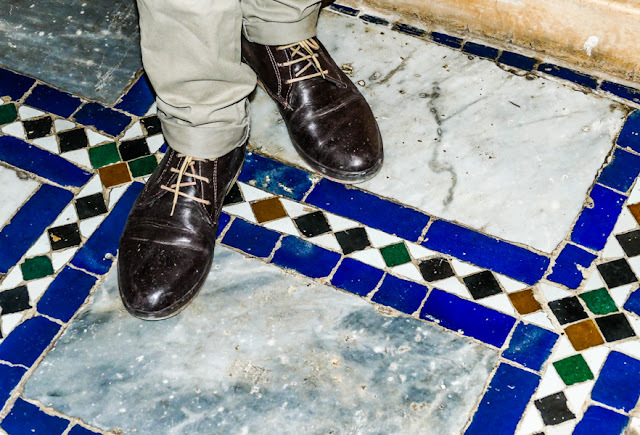 Véronique Fabre, the owner, a French lady living in Marrakech, is running this charming Residence since 2008. 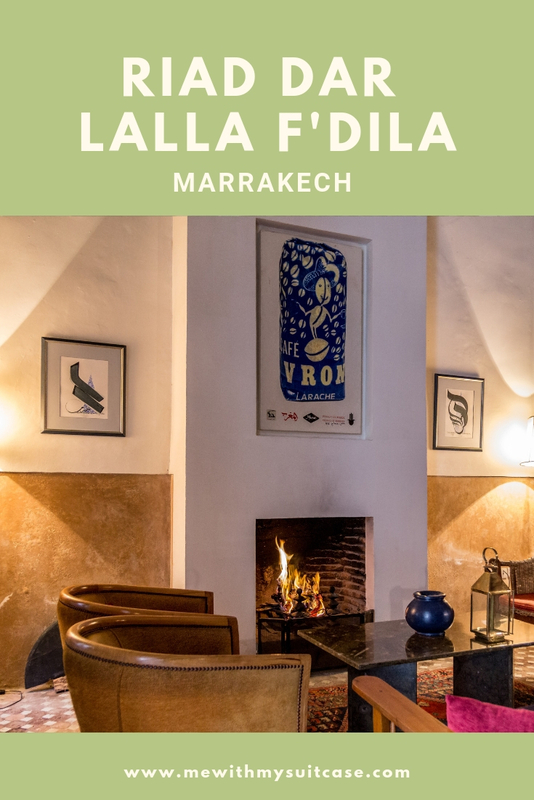 Riad Dar Lalla F’dila, in fact, is an integral part of the Marrakech Museum itself and moreover, Véronique proudly said that it was once home to Josephine Baker, the famous American-born French entertainer. The name has an evocative meaning since it is coming from the person who Véronique herself met 18 years ago: Lalla F'dila. The house initially was hers, but her grandfather sold it later. She was then disinherited, so Véronique thought to give her back which was hers through the name. 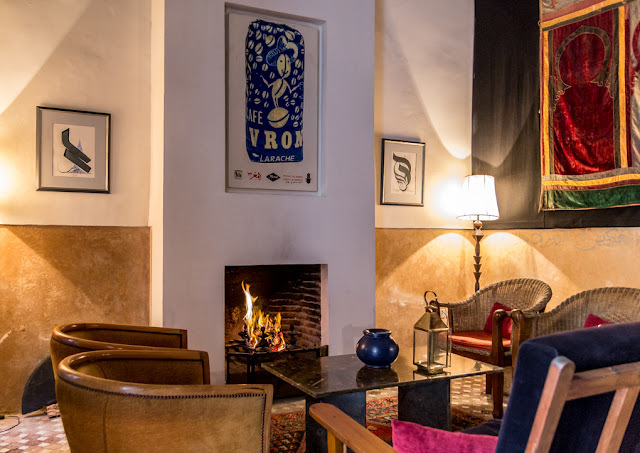 Well, the Riad was full of history and to be honest you can feel all these historical references which beside of being evident, gives also extraordinary warmth to the house. 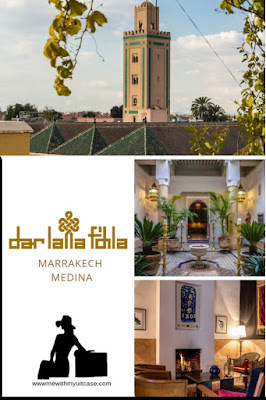 Dar Lalla F’dila has an amazing location, even in the medina, it was quite off the beaten path. Yes, this is it, disappear down a small alley, guarded from 8 am to 8 pm, you will discover that the ancient pink city holds a secret; an oasis of calm, hidden behind a small wooden door perfectly fitting for anyone looking for calm after the crazy day in the city. As we stepped inside we were instantly transported to a traditional Moroccan atmosphere. 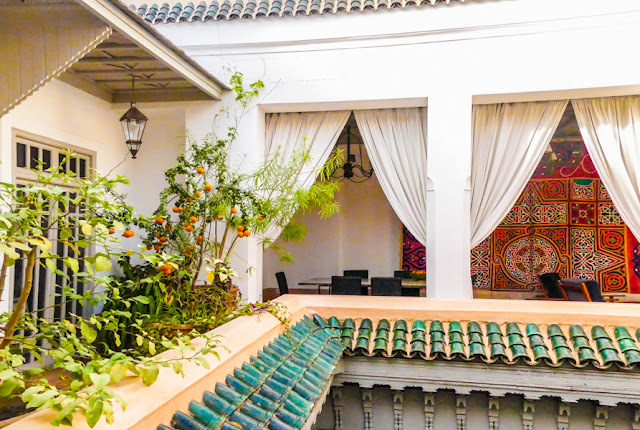 The Riad has five rooms furnished in a Moroccan style but at the same time without forgetting the comforts and without spoiling its original architecture. 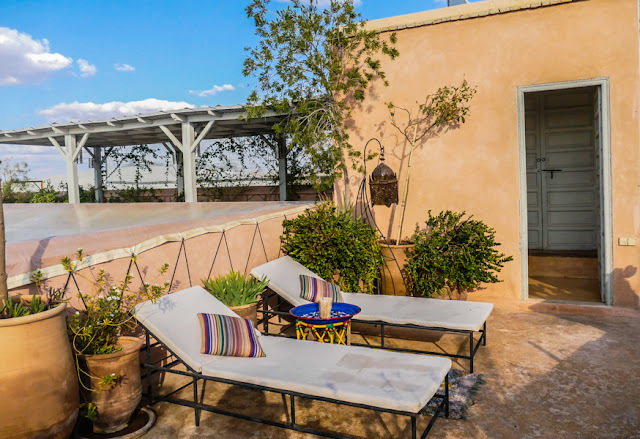 Although we didn’t use it, there is a beautiful Hammam and a stunning terrace, which I can only imagine would be the perfect place to relax after a hectic day of sightseeing. A special thanks goes to Veronique’s team: Abdou, Hafid, Najia and Fatima. They are incredibly professional and attentive but at the same time helpful and friendly at the right moment. It is really nice how each of them cooperates to make everything straight forward as it should. They are certainly an additional bonus to this riad. The day we arrived at Riad Dar Lalla F’dila, Alessandro had a fever so we decided to remain in the riad and have our dinner there. We ate some delicious chicken tajin with potatoes and some vegetable dishes. I didn’t give up on my wine. This is another piece of advice for you in fact, if you are staying in this riad, you should have at least one meal here because all their dishes are homecooked and give the real taste of the Moroccan gastronomy, not adapted to the tourist’s taste and above all during the winter the meal is served in a room with a fireplace and during the summer on the terrace. Upon request, Najia, the cook, can also prepare vegetarian or even vegan food. We highly recommend this place for you, this is certainly one of the best places to stay in Marrakech because I’m sure it will leave you with a positive experience and upon leaving, you will have a deep desire to return to Morocco. Riad Dar Lalla F’dila could be the perfect place for you. 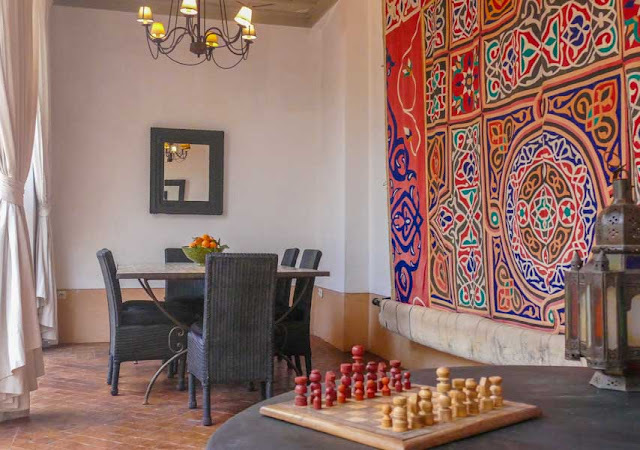 It would make an ideal base to escape the craziness of the souks and experience the local neighbourhood, whilst still being only five minutes’ walk away from all the main attractions. So, definitely consider staying here if you’re planning a trip to Marrakech. Tips for staying at the Riad Dar Lalla F’dila. § There’s free wifi available throughout the hotel (public areas and the rooms), with a strong, speedy connection. § Airport transfers are available – if you book your stay with the hotel directly for a week, you’ll get a free round trip transfer to the airport. Remember to claim your €15 booking.com discount here! Ive never been here before but the photos make me feel like I have! Excellent shots, this looks like an amazing place! So stylish and yet true to what you might expect for the region. Love the colours in the soft furnishings. We love visiting Marrakech and have been before. Its amazing the amount of hidden spaces there are! This place looks beautiful! 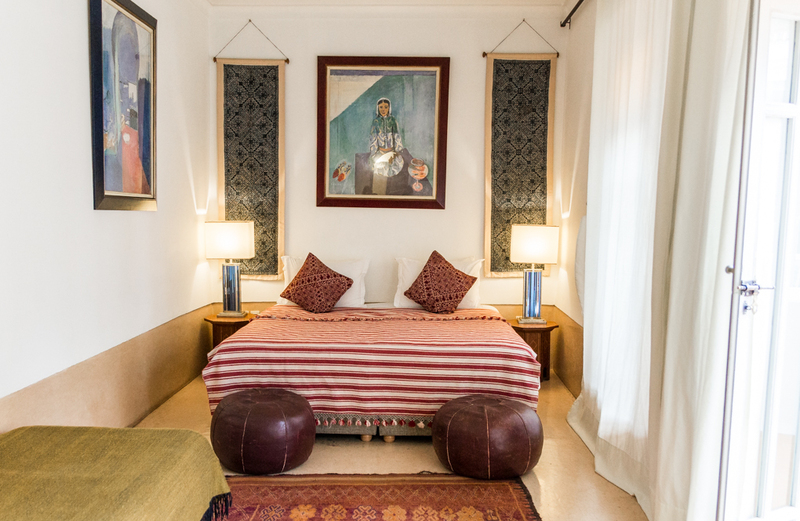 I like that the rooms have the charm of the traditional Marrakech style! Thank You for sharing your beautiful experience with us, i enjoyed your article and photography is really awesome. Wow! These are some gorgeous spots! I love getting to see the locations other people fall in love with. Thank you for sharing this! Very cool that you can get free transportation from the airport to this hotel. It looks really beautiful. Marshes really seems like an awesome destination vacation. I absolutely like the ambiance of that place! Good to hear you enjoyed your adventures in Marrakesh. Thank you for posting your experience! 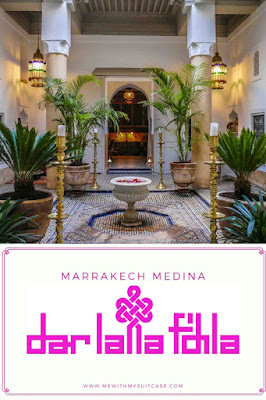 My husband and I want to start traveling and want to make a stop in Marrakesh; I can't wait! Marrakesh, has always been my favourite travel destinations. Thanks. I am glad you are sharing your experience with us. I would love to visit Marraskesh one day! 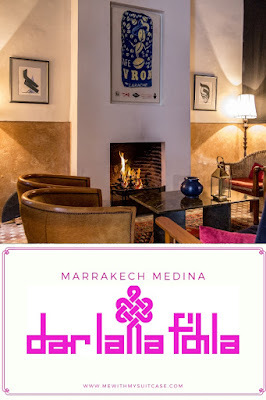 Nice reading about your experience in Marrakech. You surely had a great vacation there. I have never traveled outside of the United States someday I would love too. Your photos are beautiful. Thanks for sharing about your lovely vacation. Love everything in place, intricate design at the building and there is something interesting in every corner. These all look like lovely places to visit. I love the architecture and styles, and all the bright pops of color here and there. I've never been to Marrakech but it sounds so interesting. This place looks absolutely amazing and I bet you had the best time! That looks like a beautiful place to visit. I love the decor and colors. What an absolutely beautiful place. I love all the colors and textures! It's definitely on my bucket list.